The phenomenon of death, or nonlife as it is called in the Zoroastrian holy scripture the Gathas, is a concept accompanying the advent of creation. At the dawn of creation, twin primal spirits manifested themselves. They were spontaneously active and through encounter with each other established life and nonlife. So it shall be until the end of the world. These two primal spirits, Good ( Vahyo ) and Bad ( Akem ), are opposed in thought, word, and deed. No coexistence between them is possible. This constitutes the concepts of cosmic/moral dualism in Zoroastrianism. In his spiritual vision, Zarathushtra also conceived of two kinds of existence and consequently two worlds ( Ahva ): the spiritual ( Manhaya ) and corporeal ( Astavat ). In the seventh century, after the Arab invasion of Iran and in order to avoid persecution, a significant number of Zoroastrians migrated to India where they became known as "Parsees." Although Iran and India continue to be the main strongholds of Zoroastrians, in the nineteenth and twentieth centuries many migrated and are scattered throughout North America, Europe, and Australia. These Zoroastrians continue to preserve and practice their religion; however, expediency has compelled them to adapt certain practices and rituals, particularly those related to death and disposal of the corpse, to the requirement of their adopted country of residence. Zoroastrianism is based on seven main precepts: (1) theological monotheism; (2) moral/ cosmic dualism; (3) prevalence of the eternal law of truth; (4) existence of the bounteous good spirit; (5) operation of the law of consequences; (6) immortality of the soul or afterlife; and (7) final triumph of good over evil. Zarathushtra designates the universal supreme creator, who is transcendent, immanent, and a-personal, Ahura Mazda (literally, "the lord of life and wisdom"). Ahura Mazda is defined by six cardinal attributes: (1) sublime wisdom ( Vahishta Manah ); (2) truth, justice, and righteousness ( Asha Vahishta ); (3) boundless constructive power ( Khshatra Vairya ); (4) universal love, tranquility, and peace ( Spenta Armaity ); (5) wholeness and perfection ( Haurvatat ); and (6) immortality ( Ameretat ). Ahura Mazda is described in the Gathas as the giver ( Datar ) and the shaper ( Tasha ). Thus He (although in the Gathas the pronoun referring to Ahura Mazda is gender neutral) has not created the world, ex nihilio, but from His own existence. The Bounteous Good Spirit ( Spenta Mainyu ) that is in Ahura Mazda unfolds His immanence in its fullness, in His creation. Thus there is a unity of existence in Zoroastriansim. The teachings of Ahura Mazda, revealed to Zarathushtra, appear in the Gathas as holy hymns or mantra ( Manthra ), meaning thought-provoking words. The Gathas describes the main constituents of a human being as body ( Tanu ) and soul ( Urvan ), which live for only a limited time in the world. At the time of death, the body transforms (or perishes) and the soul goes on to live its second existence. Death has always been an enigma. From extant unearthed records, the Egyptians were perhaps the first civilized people to conjecture that after death, human beings existed somewhere and somehow. However, there is consensus that Zarathushtra was the first to introduce the idea of an afterlife that was based on morality, with rewards for the good and suffering for the evil. In the biblical period the Jews believed that the dead would continue to exist in a shadowy form in sheol, the abyss of the earth. After their liberation from captivity by Cyrus the Great in Babylon and their contact with Zoroastrians, the Jews gradually adopted the eschatological divine plan of salvation. This concept eventually appeared in Christianity and Islam. Eastern religions differ drastically from Zoroastrianism in their notion of life after death. They generally believe in rebirth as a corollary of karma. So long as the karmic force (ignorance, desire, and attachment), which is the root cause of life, exists, the life process continues. Cessation of the life stream constitutes the ideal, at which point the purified self is nirvanized and immortalized. Immortalization means the merger into cosmic nirvana. In this sense, nonlife is eternal. According to Zoroastrianism, Ahura Mazda first created the spiritual world. In His wisdom, He then created the corporeal world to manifest the spiritual world. Ahura Mazda created the universe in His Sublime Mind, shaped it in His Conscience ( Daena ), manifested it through His Benevolent Spirit, and set it into motion in accordance with the Eternal Law of Asha. He created human beings in his own spiritual image as His coworkers and friends and sparked them with God-like attributes to assist them in achieving self-realization, perfection, and immortality. He also granted them with faculties to discern between right and wrong in order to work for the progress of humanity and the advancement of the world. These faculties are the mind ( Manah ) or the ability to reason and think logically, the conscience ( Daena ), and intuition ( Baoda ). Ahura Mazda vouchsafed human beings with freedom of choice, His greatest and most significant gift. Hence individuals have the right to choose between Good and Bad. In his justice, Ahura Mazda forewarned individuals of the happiness or the suffering that results from their choices, all in accordance with the Law of Asha. Although human beings are endowed with the potential for goodness, in the end the decision between right and wrong and good and evil is the individual's alone. As a result of this right of freedom, the material world did not remain harmonious like the spiritual world. When life manifested itself, by definition, so did its twin nonlife or death. Similarly, with light came darkness; with truth, dishonesty; with wisdom came ignorance; and so on. The good creations (i.e., truth, wisdom, health, and peace) are manifestations of the Benevolent Spirit of Ahura Mazda ( Spenta Mainyu ) while their twins are the display of opposition to the Benevolent Spirit. The opposing twins are collectively designated "Evil or Destructive Spirit" ( Angra Mainyu, or later as Ahriman ). In Zarathusthra's vision, life and nonlife, truth and lies, light and darkness, all exist and are real, as with two kinds of time: boundless time ( Zrvan Akarana ) and limited time ( Zrvan Daregho Khvadhata ). In Zarathushtra's view, time and space condition existence in the world within the ambit of the Eternal Law of Asha. The outcome of the ethical struggle between Good and Bad is positive, evolutionary, and optimistic. The Zoroastrian doctrine envisages perpetuation of creation and creativity (the result of dynamism of the Benevolent Spirit) and progressive change (the result of dynamism of the Eternal Law of Asha). Theodicy, the explanation of the origin of evil without undermining the goodness and omnipotence of God, presents unsolvable problems in many religions. Doctrinal adversaries of the concept of theodicy, however, admit that the Zoroastrian doctrine offers the most rational explanation for the concept of evil. The appearance of evil is an inevitable phenomenon in the process in which the Benevolent Spirit of Goodness manifests itself. Nevertheless, the topic has aroused many debates, and consequently two opposing schools have emerged. One school, believing in moral dualism, considers evil as the creation of individuals who opt to oppose the Benevolent Spirit. In other words, evil is the negation of good and does not exist as an independent eternal force. The other school, believing in cosmic dualism, maintains that both the Benevolent and the Evil Spirits are primordial. Accordingly, the evil acts of individuals are driven by an evil force and the conflict and clash continues up to the time when Good finally prevails. A subschool, a corollary of moral dualism, maintains that although Evil is no more than the negation of Good, it assumes an independent existence when it manifests itself alongside the Good and starts functioning independently ( Farhang Mehr ). Both cosmic and moral dualists hold that Good ultimately prevails over Evil and that at that time, the world is renovated or " refreshed" and characterized by peace and harmony. The two schools also agree that regardless of the origin of evil individuals ultimately decide whether to commit evil and as such will have to requite. The Gathas does not speak of death, but rather of life ( Gaya ) and nonlife ( Aiyaiti ). The body, which is made of matter, may be alive or dead; the soul, however, never dies, experiencing one form of life in this corporeal world and another in the spiritual world. Zoroastrians believe in the survival of the soul after bodily death. The nature of the individual's other life is determined by the Law of Consequences, a corollary of the Law of Asha. The Law of Consequences is generally known as the principle of reward and punishment, whereby righteous acts in the world are rewarded with sustained happiness and evil acts, with misery. In Zoroastrianism, the Eternal Law of Asha determines the consequences of an individual's acts and the fate of the soul after the individual's physical death. Asha is God's will. The individual's thoughts, words, and deeds in this world, through the exercise of one's free choice, set the consequences ( Mizhdem ) into motion and condition one's life and future according to the Law of Asha. Hence there is no predestined fate; the acts have predestined consequences. Human beings seek happiness ( Ushta ) in life. Happiness originates in the Law of Asha, which prescribes a life of joy for the pious and eternal woe for the wicked. The Gathas warns individuals not to be deceived by ostensible or temporary victories that are illusory, nor to be disheartened by temporary defeats brought about by blows or condemnations from evil ears. In the end, the evil doers will pay for their arrogance and unjust acts. The Gathas does not specify particulars on the nature of consequences nor does it mention specific rewards or punishment. Life in the hereafter is the continuation of life in the world. In this world, the righteous people ( Ashavan ) create the realm of righteousness ( Ashahya Gaeta ) that continues in the next existence. The concepts are indescribable in detailed terms, rather the terms refer to the best existence, defined as everlasting joy, tranquility, and peace as against the worst existence, defined as everlasting woe and anxiety. According to the Gathas, the souls of the righteous people go in a state of perfect happiness, referred to as the Abode of the Song ( Garo Demana ), also called the Abode of the Good Mind ( Vangheush Demana Manangho ) or the Abode of Endless Light ( Anghra Raosha ). The souls of the evildoers go to the Abode of Wickedness ( Druji Demana ), also referred to as the Abode of the Worst Mind ( Aschishtahya Daena Manengho ) and Worst Existence ( Achishta Ahu ). These terms confirm that in Zoroastrianism heaven and hell are states of consciousness and not concrete geographical regions. The Gathas alludes to a dividing line, a crossing boundary or bridge ( Chinavat ) between the two existences or the two worlds. No particulars about the shape or the locality of the bridge are provided. The term may have been used metaphorically indicating the end of one state of existence and the commencement of another or it may be a reference to a point of time when the final judgment is effected. According to the Gathas, the judgment takes place at death and before the deceased's true self or conscience ( Daena ) attempts to cross the bridge. On that occasion, the prophet will be present. This does not, however, imply the likelihood of any mediation on his part because there is no possibility of mediation or redemption by anyone. The predestined Law of Asha will run its course. The prophet's presence is simply a matter of good leadership; the soul of the pious will have an easy crossing and will be ushered into the next existence by his or her happy conscience as well as the prophet. The soul of the wicked will be led by his or her conscience to the worst existence. Zoroastrianism originated in ancient Iran sometime around 2000 B.C.E. 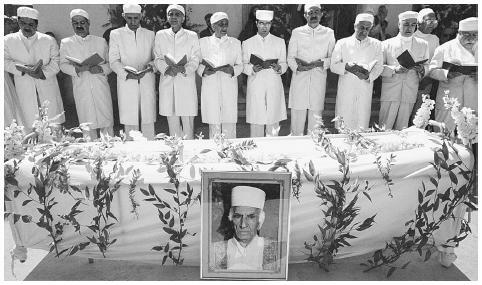 In March 2000 at the Zoroastrian Qasr-e-Firoozeh cemetery in Teheran, Zoroastrian priests prayed at the funeral of the religious leader of the Iranian Zoroastrian community, Dastur Rostam Dinyar Shahzadi. called Misvana Gatu, where the souls of such persons reside. The reason the Gathas does not incorporate this concept is logically coherent. In Zoroastrianism each act has its own reward: potential happiness or suffering. The good and bad deeds are not added in the end of one's life to determine the level of reward or punishment. Recompense or retribution is not based on the excess of good deeds over bad deeds or the reverse. The concept of an intermediary place cannot be rationalized with the gathic doctrine. The method of the disposal of the dead is a controversial subject among Zoroastrians in the twentyfirst century. The methods used are the system of the Dakhma ("Tower of Silence" as it is called by Westerners), the burial system, and, less frequently, cremation. Dakhma is a stone-surfaced tower, built on an elevated earth outside town, on which the corpse is exposed to be devoured by vultures. The heavy bones left behind are either buried or placed in a drain beneath the surface of the Dakhma where they are destroyed with chemicals. No Dakhma dating before the Arab conquest of Iran has been unearthed. Historians suggest that this practice started later in the Arab period to avoid desecration of the dead by the Muslims and that the low walls of the Dakhma increased during the period of the Turk and Mongol invasions. If the practice of using the Dakhma existed at all in the pre-Islamic period, as it is insisted by the Parsees in India, it must have been in order to preserve the environment, a concept Zoroastrians diligently observed; the Dakhma was used to prevent the pollution of soil and water and to avoid making land unusable for agriculture. In 1937 the Zoroastrians in Iran started using the burial system along with the old system of Dakhma, but currently they use the latter almost to the exclusion of Dakhma. In contrast, the Zoraostrians of India still rely solely on the Dakhma. In the West, with some exceptions, the burial system and cremation are used. Tradition requires the performance of certain rituals for the departure of the soul. According to traditional belief (not specified in the Gathas ), the soul of a dead person lingers on earth for three days and nights following the death and stays near the place where the head of the dead was resting immediately before death, recounting all the acts the person had done in his or her life. The righteous soul chants the sacred hymns, experiencing great joy while the wicked soul recalls the evil acts, experiencing great sorrow. At the dawn of the fourth day, the soul starts its journey to the next existence or world. At the Chinavat bridge, it is met with his or her conscience ( Daena ) that accompanies the soul to its final destination. Certain prayers and rites are performed during the three days and at the morning of the fourth day. Remembrance ceremonies are performed on the tenth day following the death, thereafter on each thirtieth day of the month for one year and finally annually for thirty years. Jews also believed that the soul fluttered in the neighborhood of his or her house for three days. The Gathas refers to the end of time. The Haptanhaiti, the immediate sequel to the Gathas, composed by Zarathushtra's immediate disciples, speaks of boundless time ( Zrvan Akarana ) and limited time ( Zrvan Daregho Khvadhata ). Thus the reference to the "end of time" in the Gathas should be a reference to the latter—the end of the limited span of time one lives in this world and the transition into the other existence. That constitutes a turning point in life. For the righteous individuals this is the Great Turning Point that marks the attainment of their goal. Throughout their lives the righteous use their constructive power to advance the world, serve others, and work for the cause of peace. In doing so they seek to attain perfection ( Haurvatat ) and embrace eternity ( Ameratat ). At the Great Turning Point the righteous are ushered into the eternal spiritual existence. The righteous, through both individual and collective efforts, look to that event, which is the result of a long process of gradual progress toward perfection and immortalization. That event is called Refreshment of the World ( Frasho-Kereti) and according to the Law of Asha this goal will be reached. That event will represent the final triumph of Good ( Spenta Mainyu ) over Evil ( Angra Mainyu ) and, as such, display the omnipotence of Ahura Mazda. The Refreshment of the World is related to the concept of the Savior ( Saoshyant ). In the Gathas, the word Saoshyant is used in the generic sense, meaning "a group of saintly workers." They do not appear at set intervals but exist and operate at all times, in different capacities and with different effectiveness. Saoshyants are not of the same rank in righteousness or the role that they play in the perfection of the world. The Gathic Refreshment process is a gradual process resulting from the contributions of the righteous and the operation of the Law of Asha. Refreshment of the World is the apex of perfection of the existing world in its evolutionary process. The Younger Avesta has, however, changed the concept of Saoshyant, and thus Refreshment of the World, referring to three distinct saviors, who at given periods, arise and with big strides lead the world toward Refreshment. The last one is Soshyos, the Saoshyant proper, who gives the final touch to an almost-perfected world, heralding the final triumph of Good over Evil. Boyce, Mary. Zoroastrians: Their Religious Beliefs and Practices. London: Routledge & Kegan Paul, 1979. Dhalla, Maneckji Nusservanji. History of Zoroastrianism. New York: Oxford University Press, 1938. Duchesne-Guillemin, Jacques. The Western Response to Zoroaster. Westport, CT: Greenwood Press, 1956. Henning, W. B. Zoroaster. New York: Oxford University Press, 1951. Irani, D. J. The Gathas: The Hymns of Zarathushtra. Boston: The Center for Ancient Iranian Studies, 1998. Jackson, William. Zoroaster: The Prophet of Ancient Iran 1899. Reprint, New York: AMS Press, 1965. Mehr, Farhang. The Zoroastrian Tradition: An Introduction to the Ancient Wisdom of Zarathushtra. Rockport, MA: Element Inc., 1991. Pavry, Jal C. The Zoroastrian Doctrine of Future Life from Death to the Individual Judgment. New York: Columbia University Press, 1929. Taraporewalla, Irach J. C. The Divine Songs of Zarahushtra. Bombay: Hukhta Foundation, 1993. Zaehner, R. C. The Dawn and Twilight of Zoroastrianism. London: Winfield & Nicolson, 1961. Your article was full of some good information I needed. I'll tell my friend about this website.